The eccentric and playfully self-advertising Viennese artist known as Friedensreich Hundertwasser was born as Friedrich Stowasser on 15 December 1928. He did not assume his nom d’artiste until 1949 (‘sto’ meaning ‘one hundred’ in Slavic languages and ‘Wasser’ meaning ‘water’). Even in adolescence Stowasser brought home reports from school attesting to his ‘exceptional feeling for colour and form’. 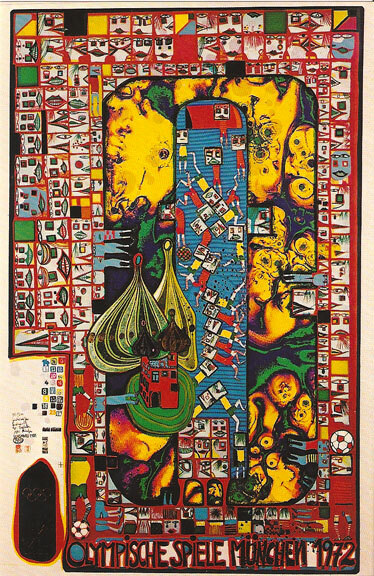 After taking the examinations qualifying for university entrance, Hundertwasser spent three months at the Viennese Art Academy studying under Professor Robin Christian Andersen. Hundertwasser was, however, more indebted to the work of Egon Schiele and Walter Kampmann, which he saw at their exhibitions, than to the brief period of academic instruction. Hundertwasser travelled extensively in Italy, where he met René Brô, whom he accompanied to Paris. Hundertwasser had thought of continuing formal training at the École des Beaux-Arts but spent only one day at that institution. Instead he found the numerous and adventurous trips he took to Morocco, Tunisia, Nepal, Tokyo and Siberia inspirational for the path he intended to follow. Taking Viennese Jugendstil as his point of departure, Hundertwasser developed an abstract, decorative, two-dimensional and vibrantly colourful, utterly distinctive style distinguished by ornamental spiral and labyrinth forms, circles, meanders and biomorphic shapes. During the 1960s Hundertwasser was extremely successful, with a 1962 retrospective in the Austrian pavilion at the Venice Biennale and a 1964 retrospective mounted by the Kestner Gesellschaft in Hannover. In addition, the first comprehensive catalogue of his œuvre was published. In 1981 Hundertwasser was appointed head of the master classes for painting at the Viennese Art Academy. The famous Hundertwasser House in Vienna, begun in 1983, attests to Hunderwasser’s skill as an architect. The year before he died, Hundertwasser was working on a catalogue raisonné of his works and presented the Uelzen Station architectural project. Hundertwasser died on a cruise ship off New Zealand in 2000.